We offer our sash window restoration services to clients across Tunbridge Wells. 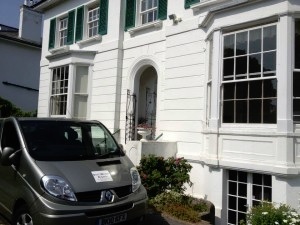 We provide comprehensive sash window renovations and repairs across the South East from our base in Crawley. We are capable of renovating any sash window to restore its original period features including the slide mechanism. We can repair them so that they meet high quality double glazed standards by reducing noise ingress and preventing draughts. With our specialist sash window restoration service you can keep these beautifully classic window designs without having to replace them entirely with contemporary window alternatives. We can restore your sash windows even if they seem beyond economical repair. We have a team of skilled craftsmen, covering Tunbridge Wells, who regularly manufacture and replicate existing moulding details for sash windows from our specialist joinery workshop in order to make sure essential period features are retained. We offer new double glazed hard or soft wood sashes in order to meet the efficiency demands of the modern home while also maintaining the same classic sash window design. The process involves fitting a pair of double glazed sashes into any existing box frame. Should it be required, Our Tunbridge Wells team offer a detailed replacement and repair service for sash windows that can prolong the life of any type of window or door. Our skilled craftsmen use specialist moulding techniques to piece in new sections of timber, creating a matching profile of your existing sash window. We also deal with the common issue of cill decay by removing the existing lower box and replacing it with a new hardwood cill, skipping the lengthy process of replacing an entire box frame so that the work is done quickly and efficiently. If you’re keen to learn more about our sash window services in Tunbridge Wells, from sash window restoration to double glazing, call us today on 0800 197 0129 or fill out the form on our Contact page. We look forward to hearing from you.